An exotic pet that terrified an elderly Miami woman when it entered her house uninvited and curled up on her chest Tuesday night is back home with its owner. "I can't believe it. I thought she was lost forever," said Raymond Fernandez, owner. "I'm glad she's okay." The 99-year-old woman woke up to find a highly unusual animal snoozing on her chest. Veterinarians later confirmed the animal was a kinkajou, usually found in the rainforests of Central and South America. At 2 a.m., the terrified woman called her son-in-law who came over immediately and found the animal in the attic. 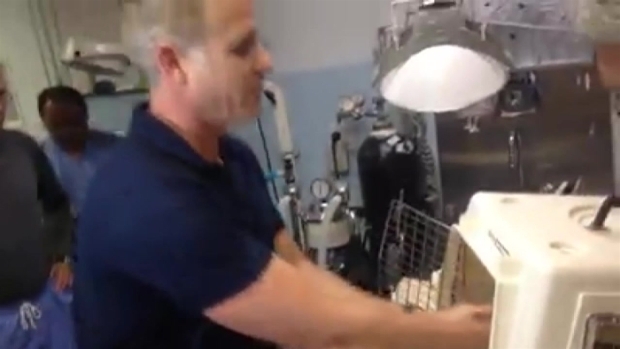 He was able to lure the kinkajou out with food and brought it to veterinarian Dr. Don J. Harris, who works for the South Dade Avian & Exotic Animal Medical Center. Dr. Harris knew the animal had to belong to someone. Raw video shows an exotic kinkajou being reunited with its owner after showing up in an elderly Miami woman's home Tuesday night. "No undomesticated wild animal like this would curl up on a woman's chest to go to sleep," Dr. Harris explained. The animal, whose name is Banana, was being cared for at South Dade Animal Hospital, where the medical center operates. Banana, who was on the run for more than a week, was reunited with its owner Wednesday morning. However, it appears Banana had caught the attention of other people in the same area, days before she was found inside the elderly woman's home. "I saw it in the bushes, kind of looking at me, and I saw a tail and we're like, 'What is that?' We called it over and it was kind of playful," said Arthur Guisasola, who spotted Banana last week but said it was too late in the evening to call animal services. "That should be home and taken care of at all times because it can cause a shock to everyone."